Underground electric power cables continue to play an important role in power distribution, and protecting them against faults and damage from impact is of paramount importance. 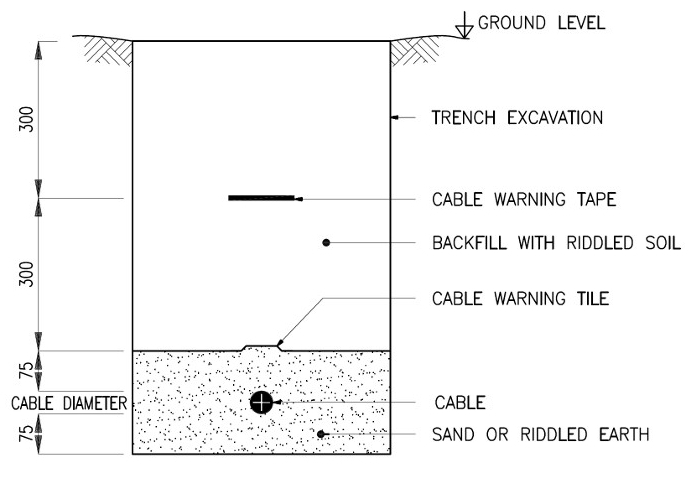 The underground cables are convenient and provide a means of connecting power where overhead lines cannot be used. Since they are buried in the ground, they are exposed to several risks which may lender them dangerous. For example, they can be damaged when people are digging trenches for other utilities, can be damaged by excavators, floods and other activities. To ensure safety, continuity and efficient power distribution with no interruptions, the underground cable must be protected against electrical faults as well as physical damages. The underground distribution switches, fuses and other switchgear are housed in a grounded; air insulated steel enclosures that keep contaminants, foliage, humans and wildlife away from the live parts. It also reduces the exposure to the live parts. The assembly is sometime referred to as pad-mounted gear and may be manually or remotely supervised and controlled. The underground cables are constructed to withstand almost all environmental conditions in the ground. They are built with protection from water ingress, corrosion and to some extent mechanical damage. However, this may not be adequate and the cables can be damaged when people are digging trenches or carrying out excavation works. Visual warnings that show that there are power cables, the cable paths, manholes and where the cables are passing. Impact protection using protective covers, tapes, pipes and other protection to provide a physical barrier and prevent damage to the cables resulting from tools or hard objects. In some places, the cables are housed in hard pipes or the conduits covered with concrete. 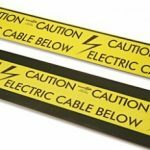 Warning tape and markers: The cable route markers are useful in giving a clear visual indication to anybody working close to the underground cables. 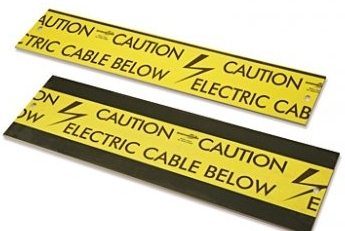 The warning tapes provide the visual warning while covers, tiles, mesh and heavy duty tapes protect the cable from impact such as during excavation or third part digging. The cable protection tapes which are usually available in roll format are easy to install and are used for both low voltage and high voltage underground cables. Common materials used include metal, plastic and reinforced concrete. Each of these has its advantages and disadvantages. The tiles and sheets are usually made of polyethylene; the material withstands damage from hand tools and other objects. The covers are made of reinforced concrete or polyethylene and imprinted with warning words and signs as required by the regulatory standards. All the warning and protection parts are required to have the words ‘Danger Electricity accompanied by the danger sign inscribed on the top side. Some of the desirable properties of the cables protection parts include light weight, resistance to impact, resistance to harsh weather and soil conditions, should not rot, environmental friendly, contain visual warning and capable of providing protection to the underground cables. The heavy duty warning tape can be 2.5 mm thick, 150 mm wide and 40 m long. Others may have 200mm wide. The cable covers are laid above the cables to protect them from physical damage. The covers are usually laminated with warning tape printed with the standard warning message. These are mostly used for low, medium and high voltages. The tape tile is thinner than the covers and usually supplied in rolls which can range between 40 meters for heavy duty tapes to 365 meters for the standard tape. The tapes are mostly used for lower voltages. 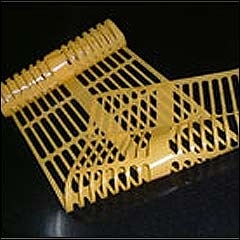 The mesh is usually a colored heavy duty plastic and usually buried at a specified distance from the underground cable so as to inform future excavators that there are cables below. A typical mesh comprises of a stainless steel tracer wire laminated with a tape printed with a warning and running along its entire length. The underground cables are convenient for distributing power in urban and other areas where overhead cables may be not be possible. To ensure safety and service continuity, the underground power cabling systems must be protected against both fault conditions as well as physical damage. A proper protection indicates the presence of underground power cables, prevents physical damage to the cable, minimizes supply interruptions and reduces the risks of accidents and personal injury. What do you think about protection systems for underground cables systems? Let’s discuss below. or copy this trackback: http://engineering.electrical-equipment.org/safety/protection-systems-underground-cables.html/trackback from your own site. This helps a great deal whe the urban areas are properly planned and ia normally safe. Very useful points shared with image explained. I will follow the points whenever required. Btw I am an Electrical Contractor by profession. This is a very good information to the H T electrical contractors. Wanted to verify the standard installation of these underground warning tapes. Is it 12″ below finish grade or 12″ above the top of underground duct bank concrete encasement? Our office details indicate the later part. Any comment?